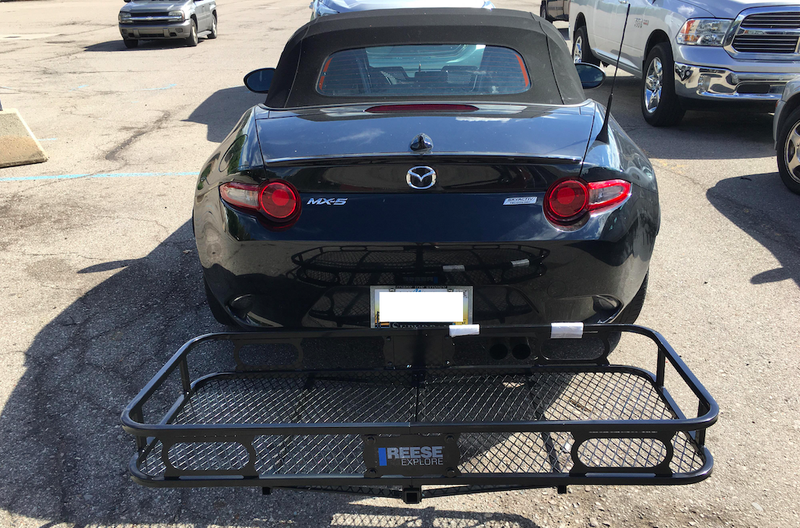 It may sound like blasphemy adding weight to a new Mazda Miata, but the lovable convertible sports car is small, and owning one really puts a squeeze on how much stuff you can carry. So my friend David decided to install a trailer hitch, and surprisingly, the whole job was extremely easy. David’s a car enthusiast who makes it a point to own manual transmission cars that are—above all else—fun to drive. So when his Mitsubishi Lancer EVO VIII RS started giving him trouble a couple of years ago, he picked up one of the best handling affordable new cars on the market today: the ND Mazda MX-5 Miata. But in so doing, he lost a pair of doors, a usable trunk, and basically any semblance of practicality. But last week, he brought the solution to that problem to my doorstep in the form of a trailer hitch, which he’d bought online for about $250. Since he didn’t have tools, and since I hadn’t seen him in many months, I agreed to help him install the thing, though admittedly, I was a bit concerned that the job would eat into my wrenching time, which is already stretched thin thanks to my numerous unfinished projects. The good news is that, even though the job required taking off the bumper cover and the bumper beam, installing a trailer hitch on a new Mazda Miata is totally straightforward—significantly more so than it would be on my old, rusty Jeep Cherokee. Things got a little tougher as we had to snake our screwdrivers and ratchets into the Miata’s wheel openings to remove the splash shield. The splash shield is actually fairly tiny, and is held on with just a couple of screws and some plastic fasteners. The two outer brackets holding the corners of the bumper cover to the body each required removing three Phillips-head screws, while the two center brackets could either be removed from the body via a plastic fastener or from the bumper cover via a couple of screws. With the bottom of the bumper cover now free, the taillights loose, and the screws in the wheel housing holding the cover to the body extracted, we just unhooked an electrical connector or two, popped the bumper cover out of the quarter panels, gently shimmied it around the taillights, and threw it on the front lawn. From there, we had to ditch the bumper beam, which just meant taking out eight bolts—two of which had to be done with a ratchet, and the rest of which a handy-dandy DeWalt impact tool made quick work of. With the bumper beam off, the holes in the rear of the unibody rails were exposed, so David could fish a nut into them—a nut that had to align perfectly with a hole in the rail. From there, we just buttoned every thing up. We threw the bumper beam on over the square hitch brackets, tightened down the four nuts, slapped the bumper cover back on, installed the fasteners underneath and in the wheel housings, tightened the taillights back up, installed the electrical connectors, threw in the trunk liner, and that was it. The result is a hitch that is completely hidden except for when a 90-degree adapter is pushed vertically into it, and held in place with a hitch pin. Adnd even then, it doesn’t look that strange. As far as weight, I’d guess the hitch only added about 25 to 30 pounds; if that bothers you, go on a diet and lose that same amount of weight, and you’ll be back to where you started. More importantly—as you can see by the image at the top of the post—the vehicle can now accommodate a tray onto which my friend can fasten belongings that would never fit in the car’s peanut-sized trunk. So basically, if you were resisting the urge to buy a new Miata because of practicality concerns: You’ve run out of excuses. Buy a Miata. Install a trailer hitch. Enjoy your hooning, and enjoy transporting anvils or bricks or whatever it is you’re into. Though maybe keep the anvils count down. You might lift the nose off the ground.